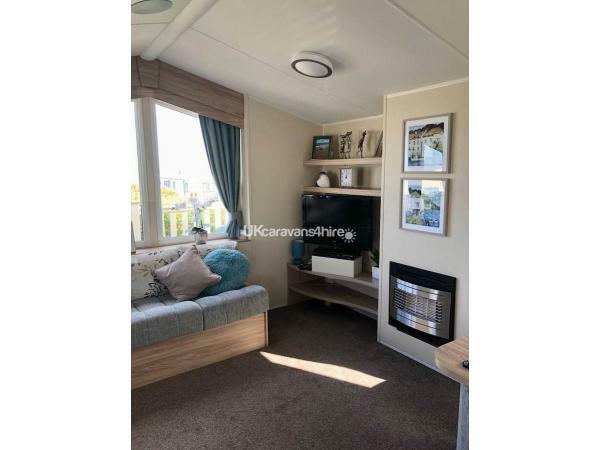 Located on Beech Rise, the caravan is sited well in order to take in the fabulous sea view from the main window and front balcony whilst maintaining a good degree of privacy and is just 5 minutes walk from the main complex. The caravan benefits from double glazing, a gas fire and warm air heating. It has a spacious lounge area with separate dining table.There is a LCD TV with built in free view and a DVD player with plenty of DVD's for your entertainment. The kitchen has lots of cupboard space and is fully equipped with a cooker, microwave, kettle, toaster, George Forman grill, electric steamer, fridge with freezer compartment and all the utensils, cutlery, crockery, pots and pans, iron/ironing board, hoover and cleaning products etc you will need to cater for yourself. 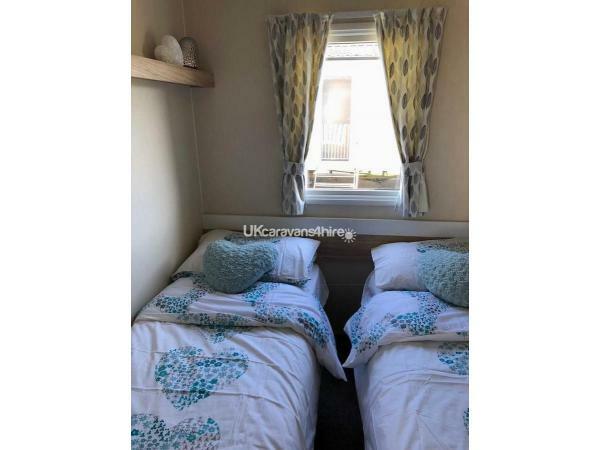 There are 3 bedrooms, the main bedroom having a double bed, fitted wardrobes and a hairdryer for your use. The other 2 bedrooms both have 2 single beds and fitted cupboards. The caravan has a shower room with wash basin and toilet and there is also a 2nd separate toilet with hand basin. Freshly laundered bed linen with beds made up for your arrival and towels can be provided for an extra charge (please inquire at time of booking). We do have a few weekends (Fri - Mon) and a few full week (Fri -Fri) dates available. Please contact the owner for more information. TERMS AND CONDITIONS: £50 non-refundable deposit per booking is required to secure your booking. Payment in full is due 4 weeks prior to your holiday. Failure to pay in full by the given date may result in your booking being cancelled with no deposit refund. Once balance has been paid in full you will receive an email confirmation and map showing the location of the caravan. An additional £100 refundable security deposit is payable on payment of the final balance. This is to cover any loss/damage which may occur to the caravan or its contents. This will be returned immediately by bank transfer following inspection of the caravan as long as it has been left in a clean and tidy condition and no loss/damage has occurred. Please allow 7 working days for this to show in your account once you have provided your bank details. Water, Gas and Electric are included in the price. 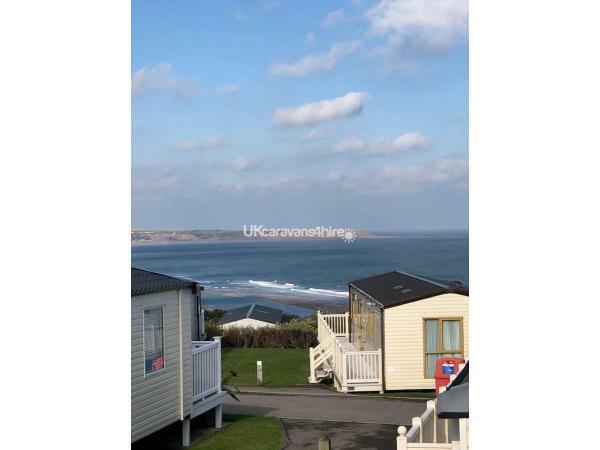 Reighton Sands Holiday Park is a Haven site and is a great holiday destination with all the usual facilities and includes fabulous clifftop views and scenic walks as well as direct access to miles of glorious sands. The park offers top quality sports and leisure activities from superb children's clubs to action-packed holiday fun in the indoor pool or outdoor Lazy River. Why not try out the challenging 9-hole par 34 golf course or relax with a meal in the Hawkwood bar and restaurant. There is a fabulous entertainment programme located in the Showbar including frequent shows, cabaret acts and competitions. Entertainment passes are not included but can be bought from the Main Reception area if required. 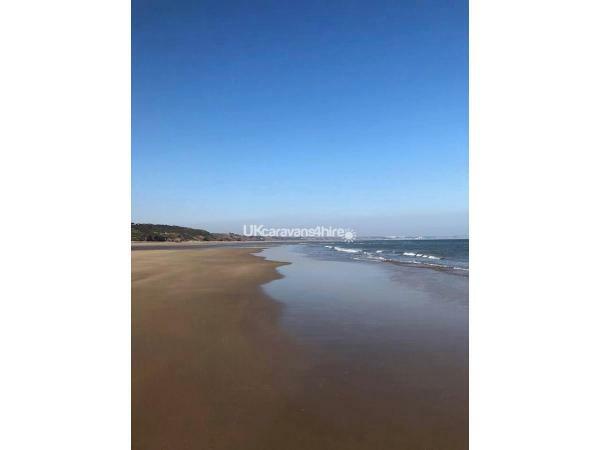 Reighton Sands is also handy for exploring this popular holiday area, with the resorts of Scarborough, Filey, Whitby and Bridlington on the doorstep. 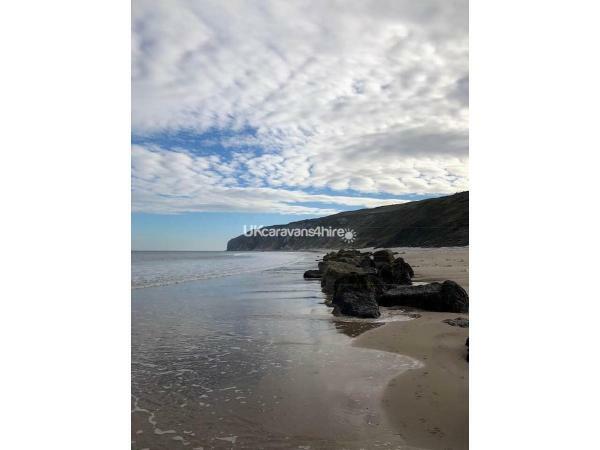 Nearby there is the North Yorkshire Moors and only a short drive away is Flamborough Head with its beautiful sheer white cliffs, lighthouses and scenic walks or Filey Brigg Country Park. Also for all ages a superb day can be had at Filey Bird Garden and Animal Park. No reviews found. 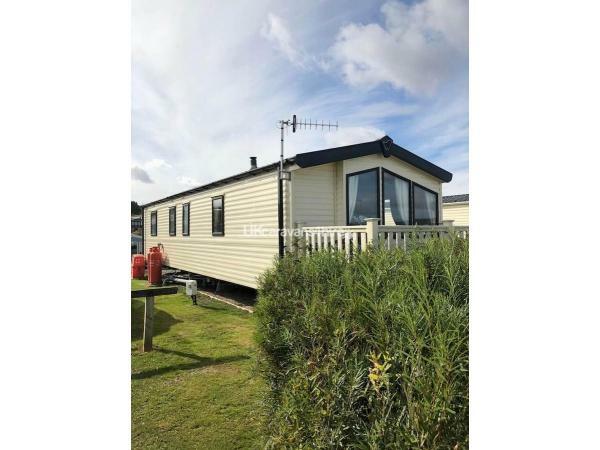 If you have recently stayed in this holiday home please leave a review, it only takes a few moments and will really help future guests when they are searching for holiday accommodation at Reighton Sands Holiday Park.